If you have known me for a while, you know that Pete and I are very dedicated to building schools for displaced refugee communities in Kenya. I’ve wanted to write to you for weeks, since returning from our most recent trip. At last I am able to write, after recovering from jet lag and catching up. I'm writing today on the Transformative Power of Hope as I saw it unfold in Kenya. There were countless moments when I was inspired by what hope does for people, and I want to share three of those with you today. I know this experience will help me when I sit face to face with couples who have lost hope in their power to recover from hurt and pain, and to rejuvenate their relationships. Imagine a dark evening, sitting around a campfire, your second night camping out in a refugee village called Lemolo. All the volunteers are sharing their experiences of the first two days. There is talk of how uplifting the happy, singing children are, how amazing it is to see the community work together, and how grateful we feel to be welcomed with open arms, hugs and tears. But the most powerful moment is when we all hear the perspective of 23 year-old Mosh. He and his family were displaced during the violence in 2008. He has seen a lot of death. He lives in the community where we built our first school and now he is helping build our third school. He says, “After I was uprooted and relocated, I felt like the walking dead. Not just me. Everyone felt it. We were dead. We had no future. No life. We had lost family members, been abandoned by our government, forgotten and left alone. There was not much to live for. We had no hope. For me, it was profound listening to teary-eyed Mosh talk about the impact of the school for him and for future generations. When we built the first school, I knew it was important for the kids to get an education in order to prevent a lifetime of crime and poverty. However, when Mosh spoke, it really sank in. The school meant so much more for the entire community. It coalesced the community and was essential for them in combating trauma. When we built the first school, it was a risk and a leap of faith. Our own gratitude for the project was nothing compared to Mosh’s account of what the school meant for him and his family. Another shining moment of hope came during the opening ceremony for the school we just completed in Lemolo. Many government officials and dignitaries came to give speeches and be part of the official opening. Just a week earlier our ground representative and project organizer, Irene Nagita, had relayed a list of the school’s needs to the Governor: the kids need to be fed, they need uniforms, the dam needs to be fixed so there is water year round, and roads need to be paved for access in and out of the community. Later at the same ceremony, the Governor got up to speak. He had not only listened; but addressed every single point Irene made. At the end of the ceremony, he shocked us all when he brought out boxes of new uniforms. Unbeknownst to us, he had arranged to donate uniforms for every student. But even more was in store…. We heard a loud beeping as a monstrous dump truck backed into the schoolyard with thousands of pounds of maize, corn and beans. The kids would be fed for the remainder of the school year! You could see the light growing in the eyes of not just the children, who would be the beneficiaries of the school’s meal program, but of the mothers and fathers. They were weeping with joy and gratitude that, for the first time in years, their children would not be hungry. We saw that that the schools symbolize hope. They become a central place for families and children to connect and build new support systems. Opening a school initiates a chain reaction that lifts up every other aspect of the community. It transforms hopelessness into hope, and spreads the belief that a brighter future is possible for these children. Perhaps the most personally moving aspect of the trip for me was re-connecting with Cynthia, an adolescent girl that Pete and I met on our first trip four years ago. Cynthia was 13. She’d lost her home and community three years earlier. She was grieving for her father who had died suddenly from kidney failure, and she was living in a two-room house with 11 children and two moms. Cynthia desperately wanted to go to school so she could become a doctor and save lives, so other children wouldn’t have to experience the loss of a parent the way she had. But the school was too far to walk to, and besides, she didn’t have the fees, so she stayed at home. Pete and I started paying Cynthia’s tuition and living expenses at a boarding school and she is now on track to graduate in November, and is excited by the prospect of college. I see the glimmer of love and excitement in her eyes as she talks optimistically about her future. The thread that ties these stories together is the power of hope. Where there once was a deep feeling of loss for these Kenyans, there is now a true belief that their life can be different. Mosh is no longer afraid to start a family. The children at Lemolo school wear their uniforms with pride and excitement (and full bellies). And Cynthia’s sights are set on a college education. I’ve come to realize that our work is about so much more than education. It’s about community, the feeling of being seen and cared for, and the transformative power of hope. I know you help couples transform their lives by giving them skills, direction and a belief in a better future. You see couples make new starts after tremendous loss, grief, or trauma they have inflicted on one another. I’d like to read some examples of the transformative power of hope in your work. Please share whether or not hope is a relevant concept for you in the section below. Saturday, January 31 in Los Angeles, CA, is a conference called Cultivating Loving Connections. This conference brings together relationship specialists from a range of treatment approaches to explore the complexities of attachment and the deeply social nature of the brain. Presenters will illuminate the processes that create change and healing. Pete and I are especially pleased to help sponsor this unusual event because registration fees will support building more classrooms for the kids we love in Kenya. Find out more and register for the conference here, Cultivating Loving Connections. The conference is a fundraiser for World Teacher’s Aid. 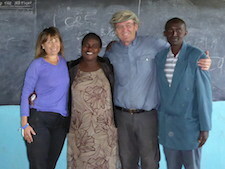 If you’d like to see their inspiring work, visit www.worldteacheraid.org. I find myself thinking about this wonderful story that you sent to us about your experiences in Africa. I found it touching and inspiring… Thank you for sharing this. I think that the lives that have joined together in this project are certainly having a positive rippling locally in Africa and to those of us who have so gently been affected from afar. The power of the story, I believe, has a lot to do with your great writing talent! I could picture being with you and feel the beauty of the people and the feelings. I don’t know what will happen when she and her husband reunite later this fall, but I believe her optimism and renewed sense of possibility will help. Thank you, Ellyn, for this important reminder that seemingly small things can shift worlds. Hi Ellyn, thanks for lovely story of HOPE in action! I would like to think that that is part of what happens whenever a couple come to counselling, I believe that they come with hope: hope for clarification, hope for support to get them out of a stuck situation, hope to improve their relationship. Helping them understand about the unhelpful dynamics involved, ways improve what is not working etc. are all ways that they can learn to help themselves. I guess we aim to teach our clients about learning to help themselves, which empowers them and gives them hope for the future and opens up possibilities that did not seem likely before. Sounds like a similar situation in a small bright part of Kenya! Well done!. I also loved the impetus the school had on the Governor to contribute and build on the success story – Hope is contagious! Isn’t it amazing how meaningful and transformative what sometimes even the smallest words and acts of hope can create, particularly in challenging situations. Hope is such a resource for us as therapists. Our couple clients can often feel helpless, depleted and overwhelmed with their relationship dilemmas, when we offer opportunities for them to touch their sense of hope with our skills of insightful enquiry we create more than just insight, fresh perspectives and advice for new ways of them interacting and communicating, we create what can be created when there is a sense of hope!. I felt hope, possibility, and love in reading this. Such a beautiful story and tribute to life and community. I cried reading your piece. Thank you for not only inspiring hope in us by sharing this literally life-changing work in Kenya, but also for reminding us how much we matter to each other. You show how love and respect, offered in concrete action, reignites that sense of belonging…and, therefore, hope…hope even for what we might consider (or take for granted) as “basic” in the U.S. In my own work, hope is central. In the Western psyche and in couples, I often see barriers against hope, protections against anticipated disappointment or rejection, against not mattering. When I bring this dilemma to the fore, clients often take more risks, even if small, and the results are often quantum leaps in connection. Hope is so essential to our work as well as to people who have so little and appreciate so much. Couples often come with no vision for their future. Giving them possibilities is crucial to our work as this motivates them to do the work needed to make their new vision a reality. I applaud your work in Africa. It must be very satisfying for you. We have long been supporters of the Hunger Project which focuses on helping women help their families. We had some training from you in 1992 in Mpls., MN. Though we are now retired, we continue to use the developmental concepts with our family members when they ask advice about their relationships and with young therapists we know who are just starting out. We respect and appreciate the practicality and humanity with which you deal with people and live your life of service. Thanks for sharing with us. How wonderful…when people help each other-just as you have been doing far away from your home base.